Positive affirmations; you've probably heard of them before. The big question is do they actually work? The answer to this question is not so straight forward. It depends on how you use these affirmations as to whether they help you manifest your desires using the Law of Attraction. Looking at your reflection in the mirror repeating "I believe in my abilities and can achieve anything" is about as useful as an inflatable dartboard if you do not really believe it to be true. So, what's the big deal with these positive affirmations? If these affirmations are so useless then why are experts always recommending you introduce them to your daily routine? 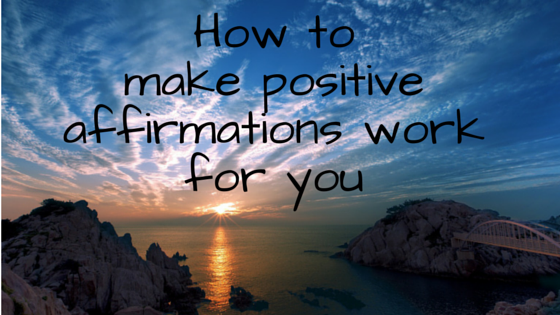 Well, people do gain successful results from using daily affirmations. Here's the catch though: it's not the affirmations themselves which produce the results. Positive words on their own without emotional backup are pretty much redundant. In order to affirm a positive thought you need to create an emotional connection to it. Convince yourself that your desire is already the truth, as opposed to just saying positive phrases you wish were your reality. To keep things simple, I advise you to continue saying your positive mantras, phrases or affirmations (whatever you wish to call them). They can help you stay on track. All you need to do now is learn how to integrate your daily affirmations with your core belief system. It's honestly not as hard as it sounds. Keep reading to see how. If you are going to use affirmations then you might as well use them properly. There is no complicated formula, nor is it an exact science, but when you do get it right you will know! It is actually stupidly simple and I am going to explain it to you in the most straight-forward way possible. You may already have this part figured out but if not, figure out which area of your life you would like to see improvements in. I am grateful for the love that is in my life. Wherever I go in life, wealth follows me. I live a life of abundance, wealth and success. Be creative and have fun with it. Write down some ideas. Say your affirmations. Out loud or in your head, it doesn't really matter, whatever you feel most comfortable with. One affirmation at a time works best. This enables you to focus better. Repeat over and over. At the same time, visualize how you will feel with this statement being your reality. The more you immerse yourself into the visualization, the more you will benefit. You want this to feel as real as possible. Involve as many of your senses as you can: sight, hearing, smell, touch, taste. Most importantly you need to create the feeling you will experience emotionally. As you get the hang of visualization this will start to come naturally. You need to use your affirmations and visualizations to start changing your core belief system. They will act like a prompt when rewiring your brain to a default positive mindset. This is the bit everyone looks forward to. You will only get to this stage when you bring your desires forward into the present moment. A great way to this is by having an attitude of gratitude, an "already got" mentality. You may have started to notice a pattern - how similar those steps are to some of the other Law of Attraction methods I have made posts on. Here and here. Positive words hold a lot of power on their on but when you throw in positive emotions on top you gain a ridiculous amount of power. Use this exact technique daily. It will not be long until you are wanting to share the power of affirmations with your friends. If you enjoyed this post please share on Twitter or Facebook.